Filipinos are known for their resiliency and positive outlook in life. And the people of Leyte are no exception – it has been almost two years since Typhoon Yolanda struck, and the days, weeks, and months that followed all point to the city recovering completely from one of the most devastating calamities in its history. This year, Jollibee is one with the nation in celebrating the recovery of Leyte with the opening of its 900th store in Palo in October, as it aims to bring joy to the people and symbolize the upward outlook of the local economy. In line with its 900th store, Jollibee is launching the 900 Reasons to Smile Art Competition, a venue where artists from all over the country can creatively depict the many ways Filipinos can find positivity in their daily lives even in the midst of challenges. “It has been said that a new Jollibee store is an economic growth indicator in an area, and a sign of positive things to come. And as a brand that promotes the joy of family, we would like to do our part in spreading happiness to the people of Palo. With the 900 Reasons to Smile Art competition, we’re inviting artists across the country to draw inspiration from the events of Leyte, and come up with materials that will showcase the optimism of the Filipino people”, said Jollibee President Joseph Tanbuntiong. The 900 Reasons to Smile Art Competition is open to all amateur and professional artists, and the medium for the competition will be painting in oil, acrylic, or watercolor. Minimum size for an entry is 3x4 feet, while the maximum size is 4x5 feet. Entries must be submitted by courier on or before September 17, 2015 to Strategic Works, Inc. 2F Zaragoza Building, 102 Gamboa St., Legaspi Village, Makati City 1229. Submitted entries must be signed by the artist and properly labeled at the back with the following details: artist’s name, address, contact number, title of the art piece, medium used, size, and year. 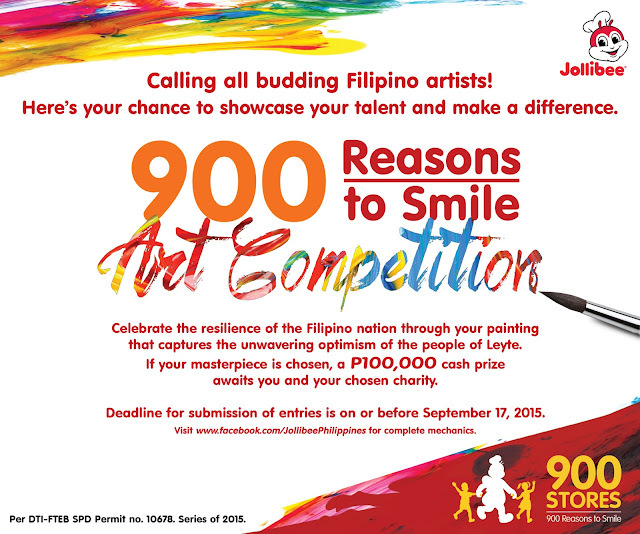 The winner of the 900 Reasons to Smile Art Competition will be announced on September 25, 2015, and will receive P100,000 while his/her art piece will be unveiled and displayed at Jollibee’s 900th store during its opening. Jollibee will donate another P100,000 to the winner’s preferred charitable institution or advocacy group. For more details, interested parties can visit the official Jollibee Facebook Page: www.facebook.com/JollibeePhilippines.